School district All Columbus Csd 2503 Fra Co. Gahanna Jefferson Csd 2506 Fra Co. New Albany Plain Lsd 2508 Fra Co.
New Albany, Ohio, is a city that’s mostly located in Franklin County. (A tiny part of the city is based in Licking County.) Its name is claimed to have derived from Albany, New York because the first settlers of the community migrated from there. The community is a small one with approximately 10,000, but it possesses a very powerful economy. In fact, New Albany is one of the most affluent cities in Ohio. If you need to run errands or grab a bite to eat in New Albany, you’ll be able to find boutiques, grocery stores and eateries along Main Street. Speaking of eateries, check out Hudson 29. This restaurant is praised by residents for its chic atmosphere. Some of the foods it serves include sushi rolls, salads, sandwiches, entree plates with beef, chicken or fish and more. Hudson 29 also serves brunch. The Jeanne B. McCoy Community Center for the Arts is a facility dedicated to the performing arts. It contains a 786-seat auditorium, a dance studio, classrooms, a rehearsal studio and a scene shop. Whet your appetite for the Taste of New Albany. The culinary event showcases dishes from dozens of local restaurants. Attending the Taste of New Albany will help the community because the New Albany Chamber of Commerce receives all the proceeds from it. Rose Run Park is filled with leisure trails and a creek, making it a good place to take a quiet stroll. You can find it at the corner of East Dublin-Granville Road and Market Street. Columbus Monthly considers New Albany to be one of the best school districts in the state. Its public school district contains two elementary schools, one middle school, one high school and a learning facility for students in the 2nd through 8th-grade levels. Its private schools include a Jewish day school and a college preparatory school for ADHD and dyslexic students. This small town is a haven for single family residences because nearly 90 percent of homes in New Albany fit that category. Other New Albany real estate properties include mobile homes, townhomes and apartment complexes. Many of these residences are fairly new (built after 2000), and about 43 percent of them have four bedrooms. New Albany is a great small town in which to live, especially for families. Its excellent schools, low crime rate and proximity to amenities are solid reasons for buying a new home here. 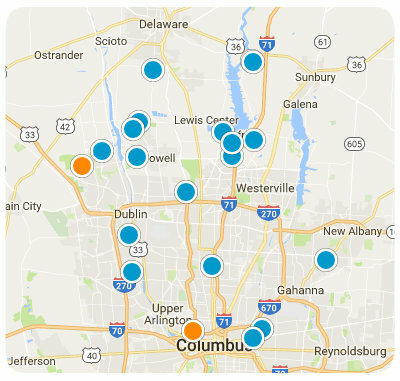 If you have questions about homes for sale in New Albany, Ohio, reach out to us, and let us help you.